Click here to watch the video of the Lectio Magistralis entitled: DEMOCRACY IN EUROPE – The Political Economics of an Epic Struggle. March 17, Torino, Italy. Professor Ugo Mattei’s eulogy follows below. We are here to honor a great economist a very successful academic, a public intellectual and a political figure among the most relevant in our century. The IUC honorary professorship was bestowed upon Yanis Varoufakis before he became a Minister of Finance of the Tsipras Government. Shortly after, Professor Varoufakis, then an established heterodox professor of Economics became a member of the Tsipras Cabinet after election, with an extraordinary personal success, as a member of the Greek Parliament. This induction ceremony, was originally scheduled for May 2015 but the political conditions at the peak of the mediatic visibility of the Greek crisis, would not allow the sitting Minister of Finance to leave the country to collect an academic recognition. Now the Greek, the European and the global crisis is by no means resolved, but Professor Varoufakis has left his post, after the historical Oxi vote in the referendum of July 5 2015, joining more than 60% of the Greek people in resisting the tremendous pressure to accept an imposed austerity plan. Varoufakis ever since never engaged in hard polemic against the peculiar choice of Syriza and its leader but, possibly disillusioned about the possibilities of corporate-captured representative democracy, did not run for Parliament, maintaining nevertheless an important political role as a leader of the Democracy in Europe Movement that in Italy will be presented in Rome next week. The one of today, however is an exquisitely academic ceremony, even if at the IUC we do not believe in the neutrality of academia let alone of economics, law and social theory so I will seize this opportunity to introduce the scholar that we have proudly appointed as an Honorary Professor at the International University College. Education. As he relates in an autobiographical essay, Professor Varoufakis started his undergraduate studies majoring in economics but, incredulous at the field’s wildly implausible assumptions and shoddy appropriation of second-rate mathematical tools, he switched to the study of maths proper, preferring to learn the original than its pale imitation. Fortunately, for all of us, the substantive lure of the subject matter of economics, namely the social organization of productive human activity, kept drawing him back in. His master’s thesis, involving the application of his mathematical training to a critical examination of the misuse of statistical tools in the study of industrial bargaining, led back to a full-scale re-engagement with economics as his field of doctorate study. In the course of his professional work in the “dismal science”, he has managed to chart a way forward for the field, or perhaps back, from a disastrous abstract and reductive formalism to an embedded form of reason analyzing an embedded form of freedom. (BA in 1981 in math; MA in 1982; PhD in Economics from University of Sussex 1987). Along with his Athens position, where he is now Full Professor of Economic Theory, Professor Varoufakis also holds a visiting professorship at the Lyndon B. Johnson School of Public Policy at the University of Texas, Austin, and is a Hoover Fellow of Economics and Social Ethics at the Universite Catholique de Louvain in Louvain, Belgium. Works. He is the author of dozens of articles in leading critical economic journals, as well as more than half a dozen books. These are: Rational Conflict (1991);Foundations of Economics (1998); Game Theory: A Critical Text (2004, with Shaun Hargreaves-Heap); Modern Political Economics: Making Sense of the Post-2008 World (2013 with Joseph Halevi and Nicholas Theocarakis); Economic Indeterminacy: A Personal Encounter with Economists’ Peculiar Nemesis (2013); and, perhaps most famously, The Global Minotaur (2011,and following editions). This last has been translated into many other languages including German, French, Italian, Spanish, Czech and Finnish. His last book is: Talking to My Daughter about the Economy (2015). In these writings, Professor Varoufakis has made central contributions to different fields such as: microeconomic analysis; game theory; the philosophy of social science; political philosophy; and macroeconomic history and policy. It is of course the last of these that is most familiar, in the form of his prominent work The Global Minotaur and its successors on the deep origins of 2008 financial-economic crisis and possible institutional policy responses at the European level. Yet this is indeed last, in chronology if not priority, and I predict his earlier contributions will ultimately prove similarly significant. It will be of course impossible to do justice to his contributions in any one of these fields, let alone all of them. I will however try to highlight two central themes that unify much of it, themes that draw together an extraordinarily broad sweep of detailed and deep substantive and methodological interventions. The first is a critical theme: the need to recognize indeterminacy as unavoidable in the study of economic, that is to say human and social, questions. He has shown, in unparalleled depth and range over the entire span of economic thinking, the persistent siren calls of formalism, namely the aesthetic lure and social power that comes with having determinate and complete “solutions” for human activities. In each case, he has pinpointed how this enterprise has come crashing on the equally persistent shoals of human complexity. He has done this especially for neoclassical economics, the approach most infected with such formalism. However, he has not spared other schools of economic thought, both today and in the history of political economy uncovering similar defects. Related to this is a second, constructive theme, of outlining the potentials of an approach to political-economic analysis that neither despairs of understanding complexity, nor premises understanding on a denial of human agency. In his pars construens, the commitment to determinacy is substituted by a recognition of inherent incompleteness and open-endedness. Understanding should not come at the cost of over-simplification of complexity nor at the expense of recognizing that there is a limit to what we can know about a topic of which we are both subject and object. This is the dialectical part. What emerges from this is a very specific, I would call, “phenomenological” conception of both social inquiry and social agency, very close to what we try doing at the IUC in our ecological take on the knowledge about capitalism. I will offer now a few illustrations to clarify what I just described as his phenomenological approach. The first one comes from Game Theory a field that is highly formalized and abstract in its mainstream but that is also highly political as the brainchild of the Rand Corporation at the peak of the Cold War. Rational Conflict (1991); Game Theory: A Critical Text (2004) (with Shaun Hargreaves-Heap) show the emergence of asymmetrical relations based on arbitrary differences reinforced through practices, expectations, and normative beliefs. Ideology develops here to stabilize extractive power relations in the bargaining. Game theory falls short from explaining the emergence and transformation of such relations in actual human history. It does not recognize conscious human agency regarding the rules because it stresses automatism in the place of dialectical/embedded freedom. What follows is an impoverished historical account of social relations at the expenses of its dynamic complexity. The critique to game theory is generalized into a larger critique, first of formal neoclassical economic modeling, then of all political-economic models that seek “ontological closure” as an attempt to deny human agency and irreducible uncertainty. To get “closure” which is the essence of scientific positivism, the model has to remove reality because accommodating reality leads to indeterminacy. Out of this conundrum, created by the imperatives of the Cartesian positivistic separation between facts and values, there are only impoverished notions of reason and freedom. Reason can only be either deterministic science or instrumental. Freedom is reduced to maximization of arbitrary individual preferences outside of any relational dimension or rootedness in specific historical contexts. A second illustration would clarify Varoufakis contribution to social theory (or the philosophy of social science). Works such as Foundations of Economics (1998); Modern Political Economics (2013) and Economic Indeterminacy (2013) succeed in delimiting the central tenets of all neoclassical thinking and relating them to broader political economy. The addiction to closure or determinacy as the sine qua non of economics as a “science” and the “inherent error” of seeking closure are exposed. Key to Varoufakis strategy as a social theorist is not to give up understanding, but to remain highly sensitive to its limits. In particular to the limits of understanding the social world that lie in the presuppositions of human agency that acts in specific historical contexts but remains able to react consciously against such contexts for the sake of greater freedom and solidarity. In his vision, incompleteness (inherent gaps and necessary errors) accompany all attempts at economic insight, since such insight is insight into the social world, not inanimate nature, with human agents interacting over time to yield irreducible complexity, even uncertainty. The political philosophy undergirding his thought develops around a particular take on freedom, reason and equality. I have already shown freedom and reason as embedded in contrast with its purely atomized, instrumental or deconstructive notions. Varoufakis thus draws a line against Hume, but most importantly and perhaps surprisingly against the view of equality as an end-state. Second, because otherwise we look to distribution in abstraction from production and power. End state equality only looks to who gets what without looking at who gets to do what and who gets to decide. Third, because his ultimate aim is not equality, but rather freedom within solidarity: this is coherent with a conception of people and communities that is irreducibly social rather than atomized in its emancipatory vision. Varoufakis vision of equality becomes a full-fledged theory and praxis of Solidarity in the Minotaur, in the Modest Proposal and in his political role as a Minister of Finance. I can only stress a few points that I consider especially relevant. The first is the interdependence of surplus exporter (such as Germany) and importer nations (Such as Greece and the European South) and thus the necessity of a mechanism whereby some form of balance is restored between such economically asymmetrical relations. The second point is the foolhardy character of attempting to have a political union follow an economic one, fashioned along the lines of the Eurozone: namely, trade integration under a common currency without integration of national fiscal policy. A third point is the myopic character of a view that refuses to consider the systematic character of our present situation, preferring instead to focus on individual actors and institutions. Economic and political actors cannot be abstracted from the pressures and dislocations of a global economic and financial system that generates increasingly higher, unabsorbed surpluses, on the back of increasing asymmetrical and unsustainable trade imbalances. The outcome of this short-sightedness can only be the fueling financialized public and private monetary creation, that is increasingly a world of its own. Indeed, one might wish to go further, and call it a critique of political economy, that rare discipline founded in the decade between 1857 and 1867, and being carried on by a few intrepid souls such as Professor Varoufakis. Such a critique aims, of course, to establish the preconditions of any political-economic analysis, in terms of historically-specific social relations. Its aim is to evaluate such relations for the sake of their progressive transformation. Through praxis, understood as exercise of historically-situated reason in a dialectic with individual and social freedom. Few can claim to have carried on the critique of political economy with as much vigor and elan as Professor Varoufakis. Not least because of his direct engaging with political praxis. In that respect, as Finance Minister he has been busy advancing a further series of notions that shacked the bigotry of the currently dominating single thought. These include the striking idea that, as priorities in addressing a country’s economic difficulties, firing custodial workers and beggaring pensioners should perhaps take a back seat to breaking up oligarchies and saving infrastructures from privatization. It continues with the odd notion that throwing good money after bad is not wise economic policy, even when it is a transfer from taxpayers and workers to profligate, ostensibly private, banks. Finally, most shocking of all, that a country’s democratic elections should perhaps have some effect on its economic policy. I would like to conclude with two points of comparison that put in sharp relief Professor Varoufakis’ contributions and commitments. A first point of comparison is with the trajectory of so many critical or heterodox economists. The pressures of isolation and inducements to conformity have all too often resulted in one of two trajectories: one leads to self-marginalization into a small band of fellow purists, entirely disengaged from the influential mainstream, with a retreat into an increasingly esoteric, or at least self-referential, universe of texts and vocabulary. Yanis might know who I have in mind! From the opposite side, the other trajectory leads to successive dilution of critical tools and insights in the bid for acceptance by the mainstream, at the cost, all too often of all cramping one’s methodological and substantive insights. We have here many examples of a strategy that might even generate a Novel Prize. Professor Varoufakis’ unflagging commitment to simultaneously developing the insights and tools of the critical tradition, and yet bringing them to bear in direct engagement with central approaches and problems of contemporary economic theory and policy is remarkable, perhaps to the point of sui generis. That he has done so both in scholarly writings in specialized journals and in more accessible presentations in widely acclaimed books is exemplary. A second point of comparison is with the mainstream. Indeed, with Paul Samuelson, the Nobel prize winning economist and author of the most influential economic textbook in history, Foundations of Economic Analysis. Indeed it is V and co-authors who have shown, in Modern Political Economics, the centrality of Samuelson’s text in forging the neoclassical consensus of the post-war era. He has provided a highly formalized presentation of Keynesian economics, purified from the fundamental, indispensable insight Keynes bequeathed to economics, namely the radical uncertainty that results from the interdependent expectations of economic actors about the future. Samuelson’s trajectory it is of course just opposite to that of Varoufakis. It is only fitting then that Varoufakis has authored his own text, Foundations of Economics: A Beginners’ Companion. 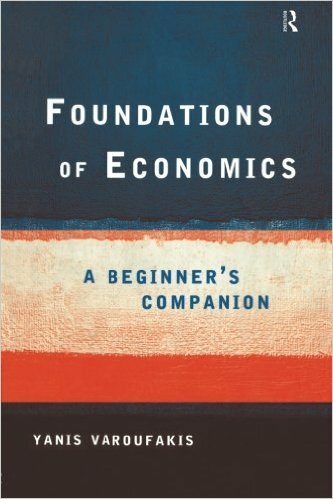 This is a simply outstanding critical introduction to economics. It is to my knowledge the only economic textbook, mainstream or critical, that highlights the most important fact confronting entering economic students. What they are studying is not something usefully called “the economy” in general, but rather a historically-specifically form of social organization of productive activity, namely the capitalist economy. Students can ultimately understand the foundations of capitalism, a system that generates very particular imperatives and opportunities for individuals as economic agents, and gives very particular shape not only to their life chances but also to their personalities, their politics and the texture of their culture. We can only hope that Professor Varoufakis’ Foundations will have a modicum of the influence of Samuelson’s Foundations. Better than hope, we should, to borrow Professor Varoufakis’ own terminology, make such a prediction as a self-fulfilling prophesy: a belief that we act and struggle to realize its truth, in praxis creating a different hegemony. * This Laudatio has been delivered in Turin on March 17 2016 during the induction of Yanis Varoufakis as Honorary Professor in Turin. I wish to thank Talha Sayed (U.C. Berkeley and IUC Turin) for invaluable help in the preparation.